A quartet of Christmas novellas by some Regency romance favorites ushers in the season with wit and distinction. 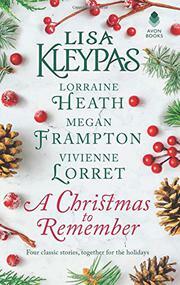 Most historical romance fans will agree that Kleypas is among the best of the best of the genre, so it comes as no surprise that her entry in this Christmas anthology is delightful. However, whereas sometimes collections with headliner authors suffer from uneven storytelling, this one delights across the board. Kleypas’ I Will charts the unexpected romance between a decided rake and his friend’s sister as he tries to convince his disapproving father to put him back in his will by courting the bluestocking, then falls in love with her. Heath’s Deck the Halls with Love touchingly reunites Lady Meredith Hargreaves and the Marquess of Chetwyn, whose budding romance was interrupted when his brother died and he felt honor-bound to marry his brother’s intended, who fell in love with someone else before he could accomplish it. Now Chetwyn wants a second chance with the woman he truly loves. Meredith, however, isn’t sure she can trust her heart to the man who already broke it once. No Groom at the Inn is a clever play on the faux fiancee theme; when penniless Lady Sophronia Bettesford meets Mr. James Archer at a coaching inn and he asks her to pretend to be his betrothed at a house party in exchange for financial freedom. The arc of the story is well-tread, but author Frampton’s lively characters and bright use of words and wordplay through the tale add depth, humor, and whimsy. Finally, in Lorret’s The Duke’s Christmas Wish, sexual tension nearly melts the pages when a duke meets the woman of his dreams even as he’s creating a system of matchmaking that devalues the very things that make her perfect for him. An enchanting, exquisitely rendered collection of Christmas Regency shorts.